Like most women, I can't help but love tiny versions of usually larger things like babies, kittens, and puppies. They're just too darn cute for being so darn small! I'll blame my feminine wiles on purchasing this fine office supply: a tiny catch-all for my various catch-all tiny things! IT'S A BABY FILING CABINET, GUYS! How cute. Wandering a thrift store one day, I passed through the office supplies through copious amounts of discarded three-ring binders, calculators from the 1980s, and half-town-out notebooks with bent misused pages. That's when I discovered a filing cabinet hidden behind some Troll-inspired paper weights. The drawers opened with ease, the label clamps with slightly loose, however I had to have it. 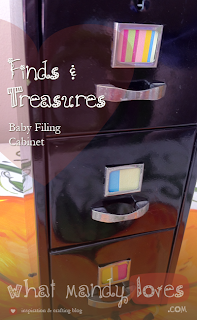 I always wanted my own filing cabinet even if I didn't have files to put in it. My home office needed something like this! What's the catch? My particular filing cabinet find must have be shrunk by a mediocre evil genius with an overeager trigger finger on his shrink ray. If rats had rat-sized offices with rat-sized papers to file, I've got what they need. 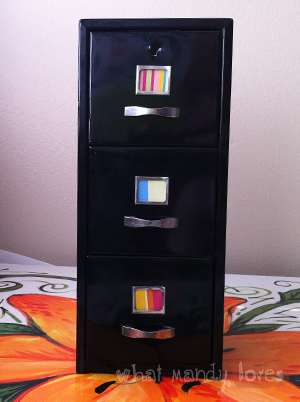 The drawers just barely fit a credit card but are tall enough to hold all kinds of miscellaneous office supplies. I even cleaned out my junk drawer of buttons, batteries, and thumb tacks just to fill up each drawer with as many miniature items as I could. Later on, I got all matchy-matchy by placing wrapper paper squares inside the label clamps to go with my magazine holder and monitor stand. Is this the best random office supply thrift store find or what?! Now all I need is a mini printer and the hypothetical rats with a hypothetical business to run can get some work done.